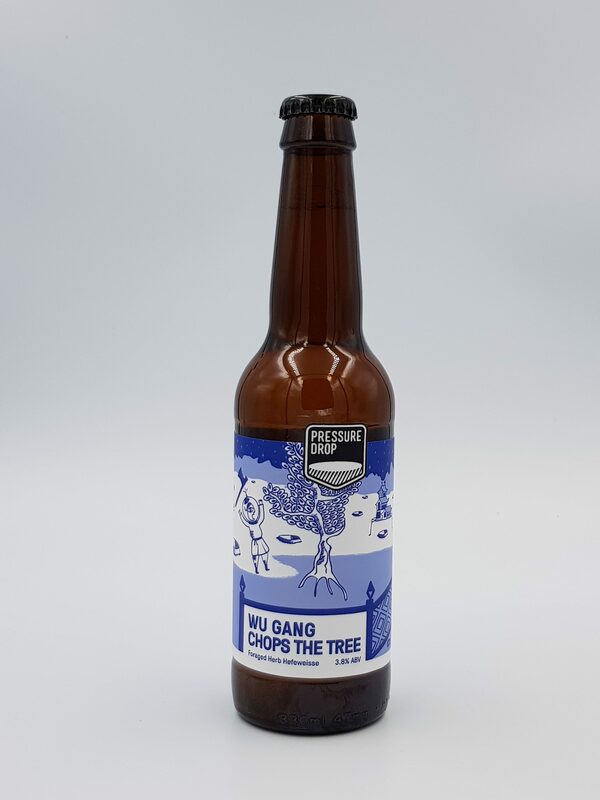 As beer names go, Wu Gang Chops The Tree has to be one of the… more unique, shall we say? Apparently it comes from a Chinese legend. Wu Gang gets in trouble – exactly how seems to change with each version of the legend – and is banished to the moon where he must chop down a tree. The trouble is the tree keeps on healing itself, so he’s stuck there forever chopping away. I bet he follows Sisyphus on Twitter. Anyway, while he’s busy swinging that axe, read up on this beer from London’s Pressure Drop Brewing, which features in the BeerBods main subscriber box on 14 December 2017. Find the brewery on Twitter at @PressureDropBrw and on Instagram at @pressuredropbrw. The usual advice for the style would be to serve this beer cold, at around 4°C to 7°C. Pressure Drop have put ‘serve lightly chilled’ the bottle, which to me suggests somewhere near the upper end of that range, maybe up to 8°C or 9°C. I reckon give it a good hour in the fridge and don’t worry if it’s a little longer than that. As ever, be wary of over-chilling your beer. More chill means less flavour. Read more on recommended serving temperatures. Pressure Drop have given us a good description on the label. This pours a hazy golden straw colour with a decent head of white foam. There are citrus and herbal notes with the pale malt sweetness up front. When I’ve had this before I’ve found the banana and clove character to be less pronounced. I’ve had this with fish and chips, and with chicken stew, and confirm that it goes very well with both of these. Wheat beer is a hugely versatile style when it comes to food pairing. It will work with light food like salad and seafood, through spicy and roast meats, and all the way through to dessert. Read more on this beer from BeerBods and Pressure Drop Brewing.